It’s that time of the year again when thoughts turn to holidays with the family. 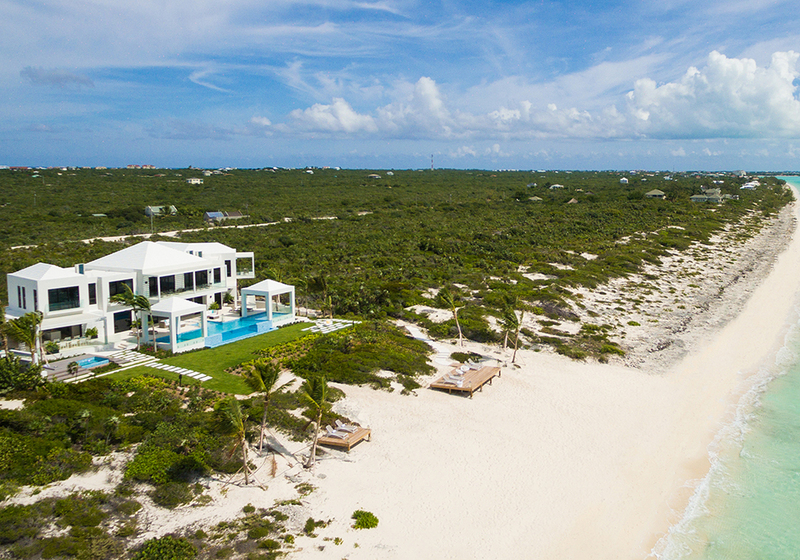 When it comes to high-end escapes, a luxury home rental is essential to complete your dream vacation. 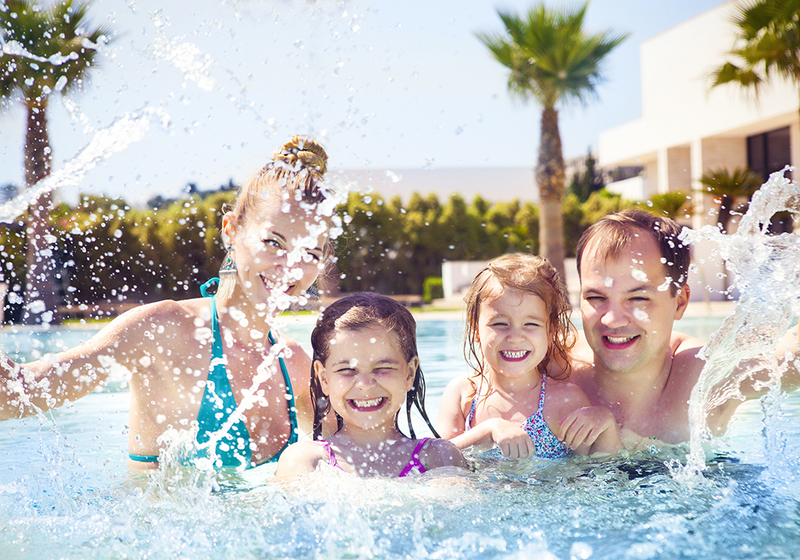 Providing a home away from home, there’s no better way to indulge the family than with a five-star residence. Whether you’re looking to the warm shores of America, cozy cabins of France, or tranquil settings of Tuscany, you’re sure to find inspiration in our exclusive pick of luxury vacation rentals. Europe really lends itself to the winter season, with plenty of culture to enjoy, as well as world-class ski resorts. With it being low season, Tuscany in winter is a good time to come. 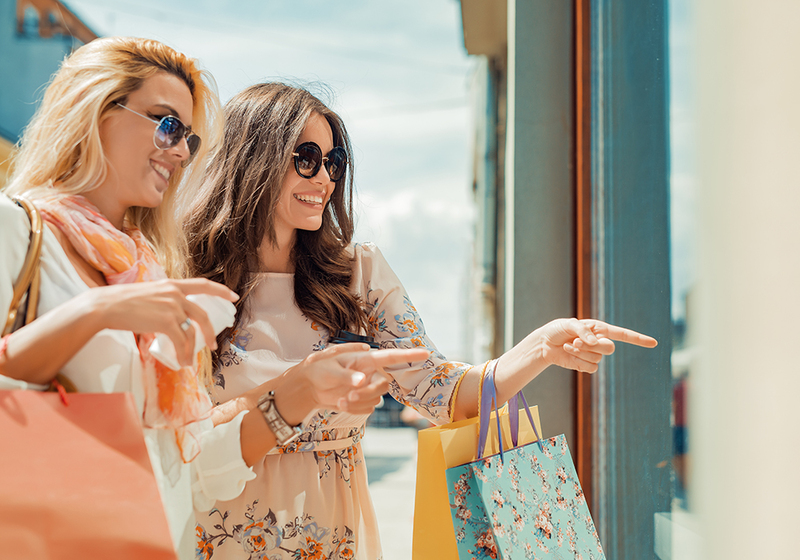 Costs are lower and there’s fewer crowds, making it handy for visiting attractions like Florence Cathedral and the Leaning Tower of Pisa. Visit in February and you’ll be able to enjoy festival season, which the whole region gets involved in. Complete your stay with a luxury home rental such as Villa Regina. Nestled in the historic region of Arezzo, there’s great museums and wonderful architecture on your doorstep, and Florence is only an hour away by car. While Tuscany also has its fair share of mountains for snow and ski (check out the Pistoia province), it’s the French Alps that ski aficionados flock to. 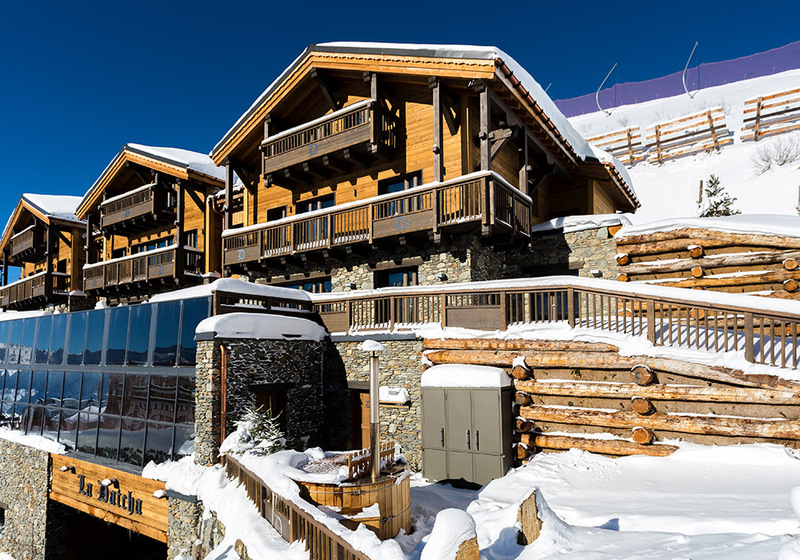 Tucked away in the French ski resort of Val Thorens, Villa Talia is on the doorstep of some of the best ski runs. And when it’s time to cool down (or heat up), its private sauna, gymnasium and swimming pool are always a hit with younger ones. This hard-to-beat family-friendly luxury house rental spans 12,900 sq ft with eight cozy bedrooms for when it’s time to retire. America has it all, and there’s no better time for families to visit than winter. At the end of November, the annual tradition of Thanksgiving makes it a wonderful time to come, plus there’s the Black Friday sales too! 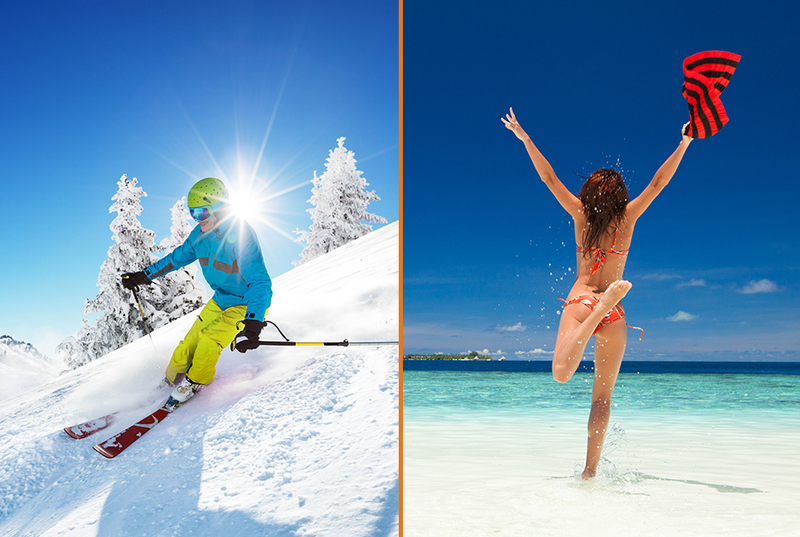 Winter is always warm in Miami, and the kids will love the many outdoor activities and water sports on offer. 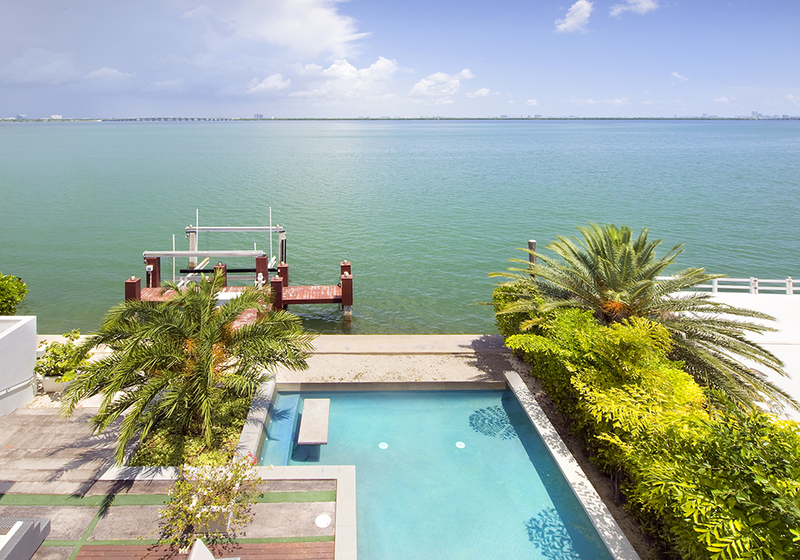 Hire a luxury villa in Miami beach, for the perfect base to explore the city. At Villa Ola you’re on the right side of Miami beach to access its many restaurants, bars and renowned night life, without being in the thick of it. 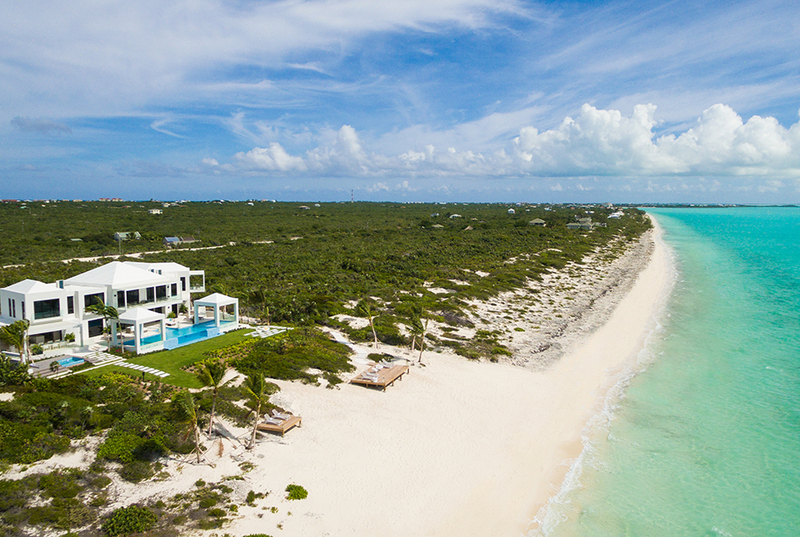 For complete luxury and escapism with the family Villa Trina in the stunning Turks & Caicos islands is a firm favourite. Here you can completely relax and unwind in this huge mansion, right on the golden shores of Long Bay Beach. Complete with your own butler, outdoor movie theater, two pools and private tennis courts – it’s hard not to feel spoilt, but that’s what holidays are all about – right!? So, pack your bags, book time off work and gather the kids, for an unmissable break to one of our stunning winter destinations. 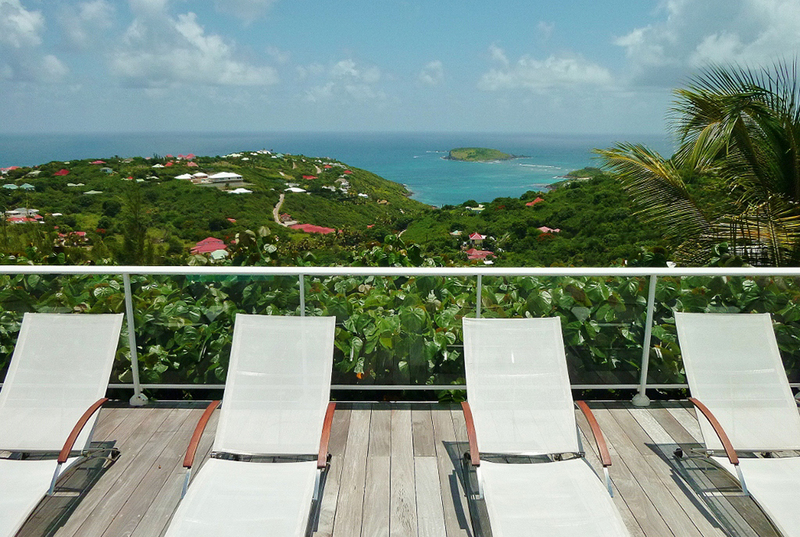 For the best value luxury vacation rentals, visit Global Luxury Villas. With a wide selection of high-end properties including concierge services, you’re guaranteed a memorable stay. 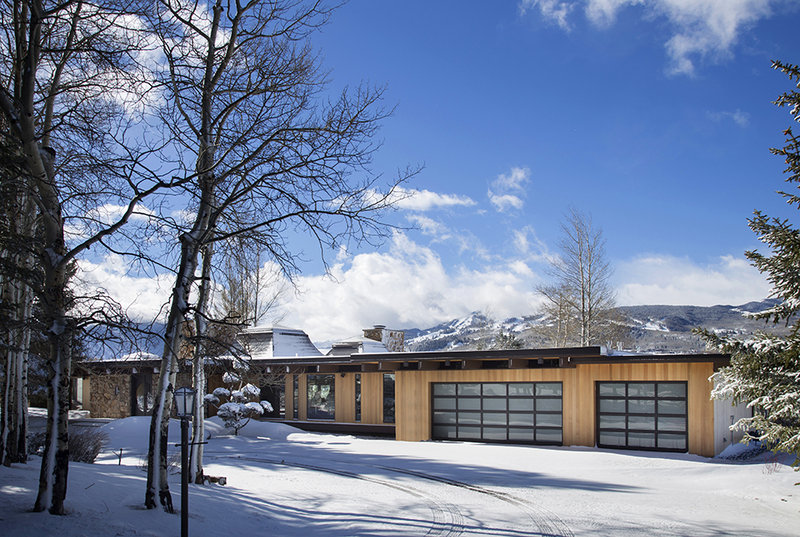 If you promise yourself every year that you’ll go away for the holidays, or if you dream of a white Christmas, then now’s the right time to start booking your Aspen villa rental. 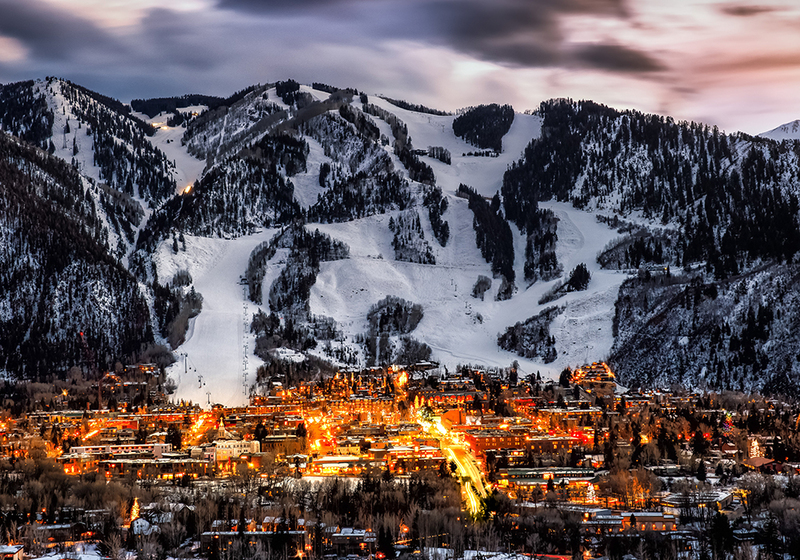 With its famous white washed mountains, brilliant blue skies and world-famous snow and ski facilities, there’s no better destination for family fun than Aspen, Colorado. The Rocky Mountains provide the perfect backdrop for this magical winter wonderland that welcome an influx of visitors around this time of year. To make your stay extra magical, here’s a few pointers for achieving a five-star get-away. The perfect way to spend your Christmas in Aspen is with family and loved ones. 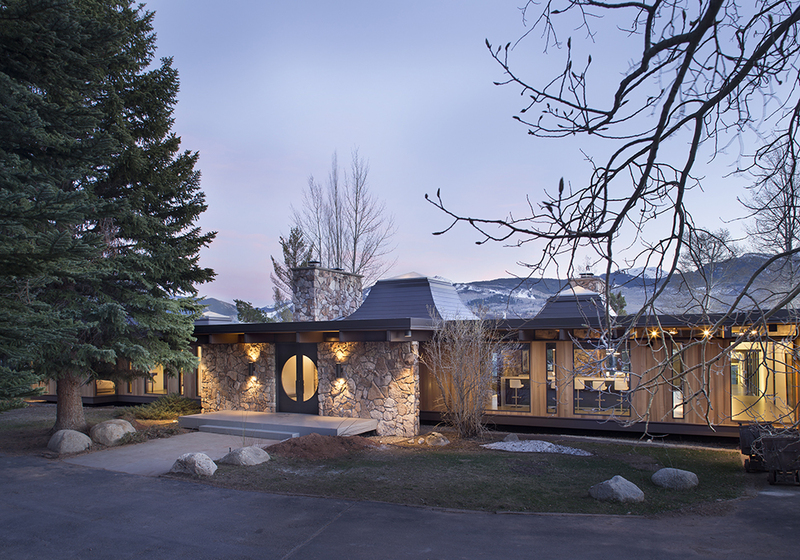 Aspen luxury vacation rentals offer the perfect base for spending time together. Villa Marylou is one of the most sought-after spots, adjacent to the Red Mountain and minutes away from the slopes. This sprawling chalet offers seven en-suite bedrooms, and rejuvenating facilities including; a gym, steam room and indoor Jacuzzi. 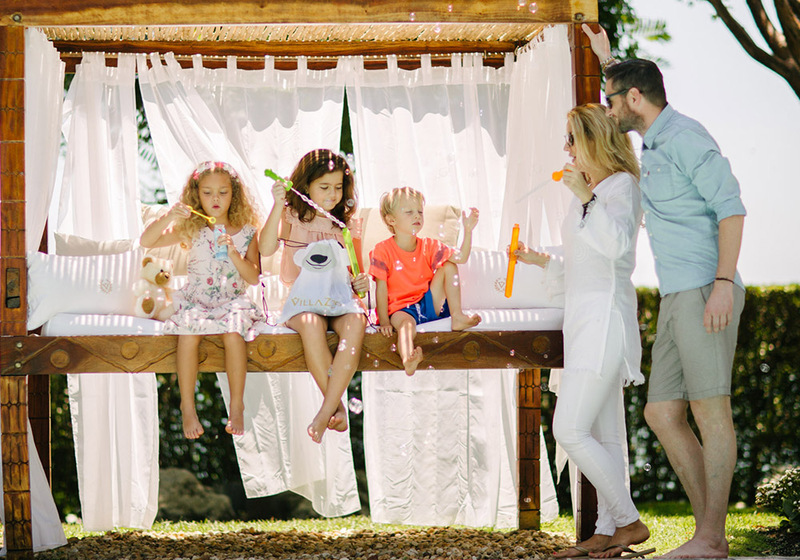 If you want to spend quality family time in undisturbed settings, look no further. If Christmas is synonymous with one thing, it’s indulging in great food and drink. 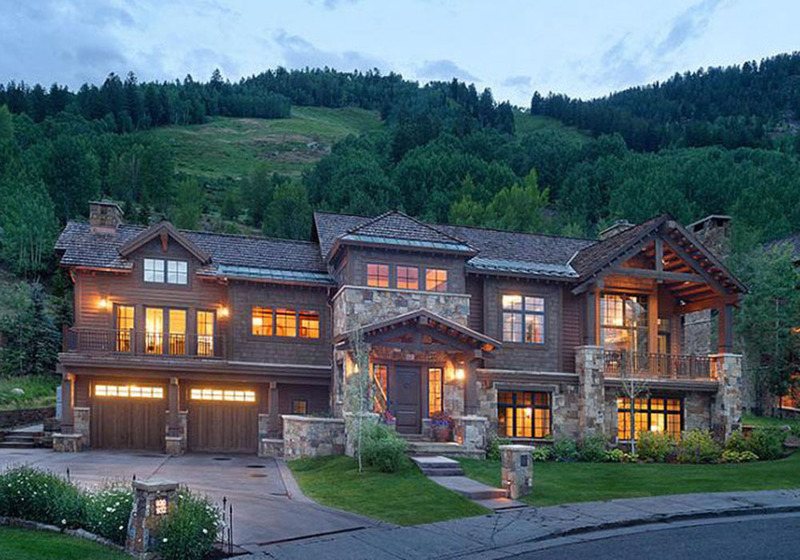 Base yourself in the heart of Aspen to make the most of the area. This buzzling destination lives up to its winter reputation as a vibrant fun place. Stay at luxury house rental Villa Lynne to be within walking distance of all the top restaurants and venues, including Belly Up – the famous live music venue in the area. One of the great reasons to come to Aspen is for the change of scenery. With scenic walks and desolate mountains to explore, there’s nothing more calming than its serene landscape. For the ultimate in escapism, stay at luxury Aspen rental Villa Justine housed in the remote hilltops for complete exclusivity. With wood-burning fireplaces, great dining facilities (indoors and out), and luxuriously designed bedrooms, it’s the perfect place for solitude and privacy. If there’s one thing a Christmas in Aspen demands, it’s a festive family ski! 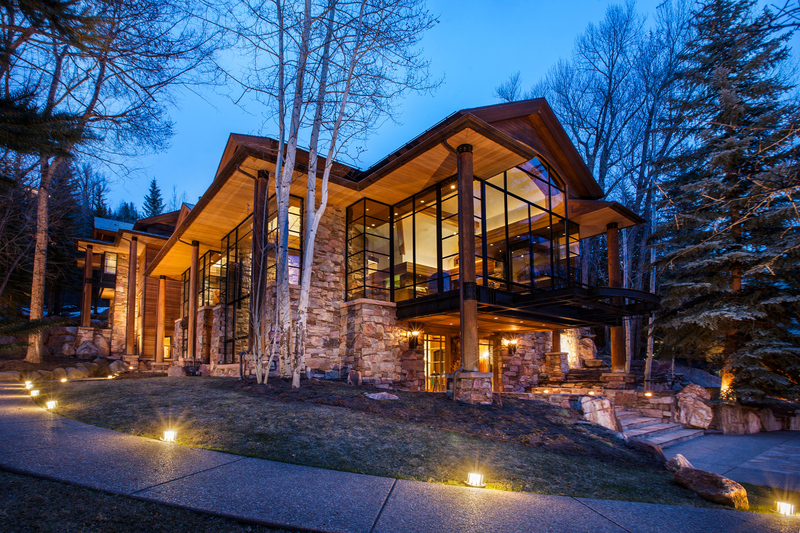 When it comes to Aspen luxury rentals, none are better positioned than Villa Malia for making the most of the local slopes. This six-bedroom alpine villa offers wistful views of the Red Mountain ski resort, as well as a host of great facilities, including your own basketball court and an indoor Jacuzzi. One of the great joys of Aspen is coming home to a cozy fireplace and enjoying a hot mug of something warming. 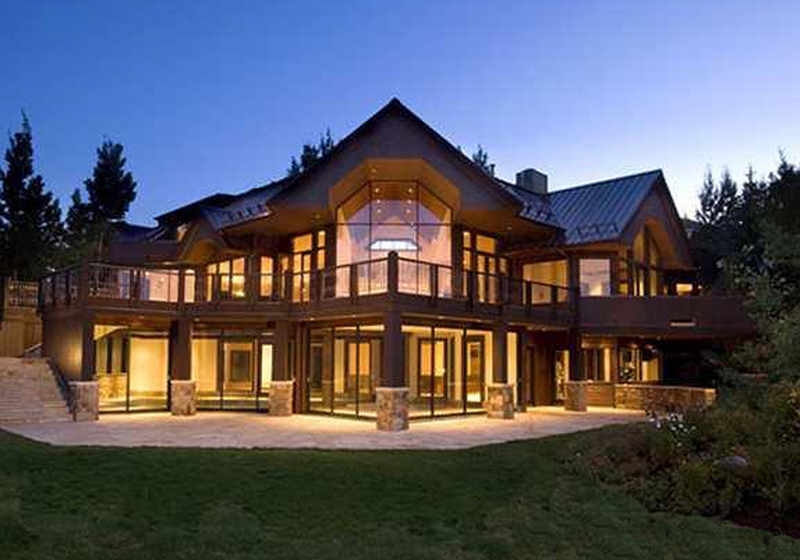 Leave the busy world behind you at Villa Molly in this secluded romantic Aspen luxury rental. This six-bedroom estate is set across three acres with every modern touch thought of. There’s plenty of space to entertain, both indoors and out (with its own hot tub) as well as boasting some of the most beautiful views across the Aspen mountains. For an unforgettable Christmas, Villazzo offers a wide selection of luxury villas in Aspen to complete your stay. With outstanding customer service and an unrivaled portfolio of properties, you’re guaranteed a five-star break. France is a great destination to visit any time of year, but particularly in winter. With beautiful white-washed picturesque villages, ski-season in full bloom and plenty of outdoor activities to explore, it’s time to pack your bags and get ready for a luxury home rental like no other. Ideal for families, fun with friends and conduce for romance, it’s easy to see why more than 120 million people flock to the French Alps every year. 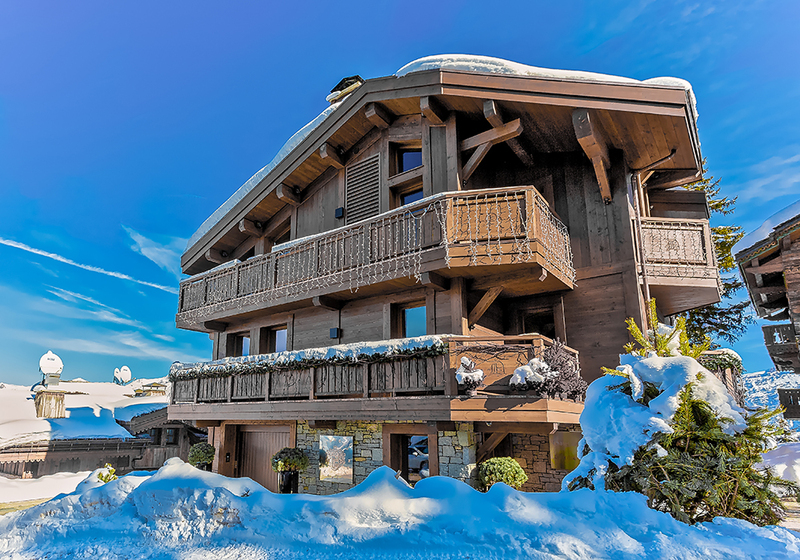 To help you decide which resort is best for you, our team of travel experts have hand-picked the best villa vacation rentals throughout top French ski resorts Courchevel and Val Thorens. All you have to do is get that ski pass and you’re off! 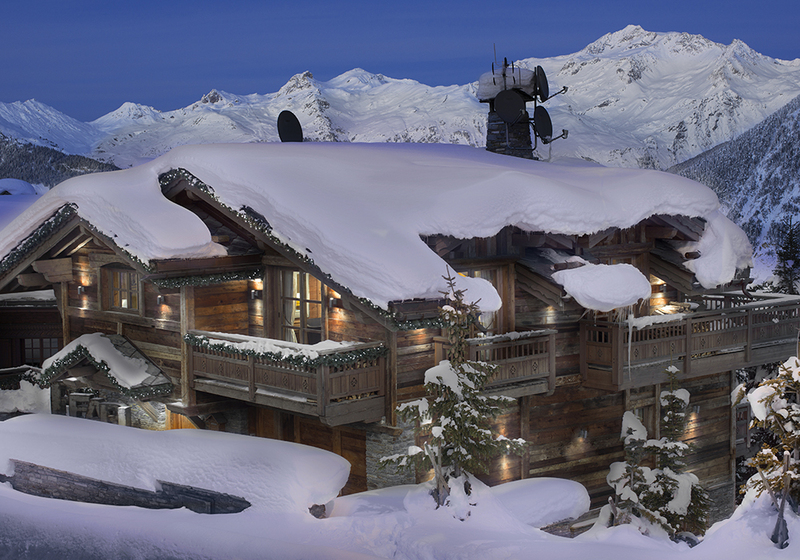 Ski by day, play by night – that’s how guests in the upbeat resort of Courchevel 1850 like to roll! Situated in the heart of town, Villa Paige is a modern four-bedroom property with everything on its doorstep. 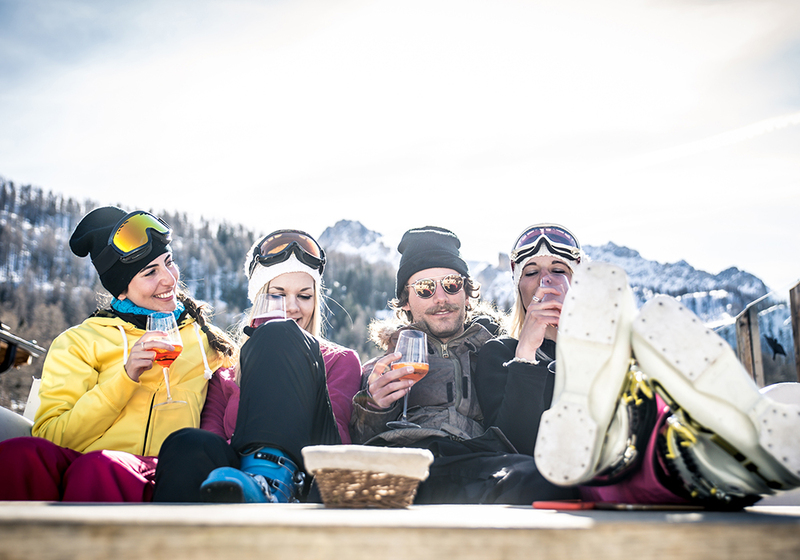 A top ski resort in reach (and ski school), as well as all the best bars, restaurants and high-end shops at your disposal make this destination great for friends and groups to enjoy. The villa also benefits from a daily maid, to help maintain the comfort of your stay. 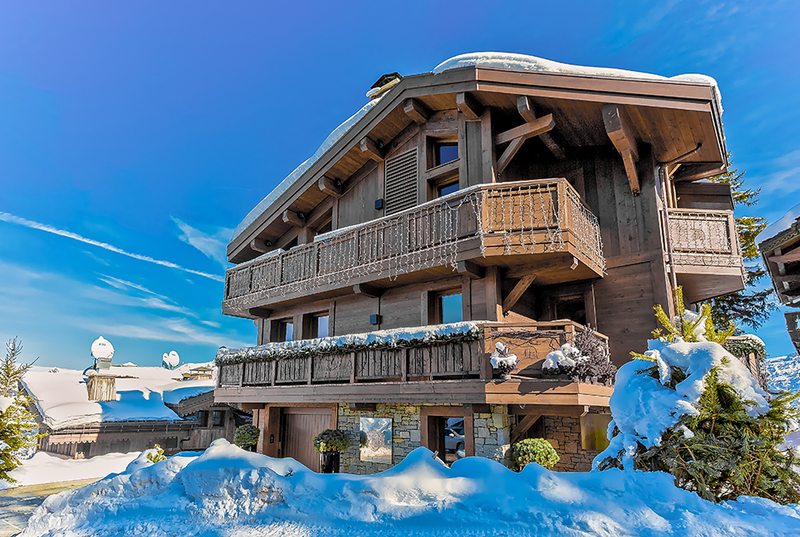 Further away in a quieter spot of Courchevel 1850, lies Villa Rayna. Situated in the ultimate skier’s playground, there couldn’t be a more exclusive destination for a five-star ski experience. This Luxury villa rental can sleep up to 15 guests and is decorated to the highest standard with finishing touches to dazzle. This includes its own private lift, personal chef, personal driver and underground spa and fitness lounge complete with steam room and Turkish sauna. 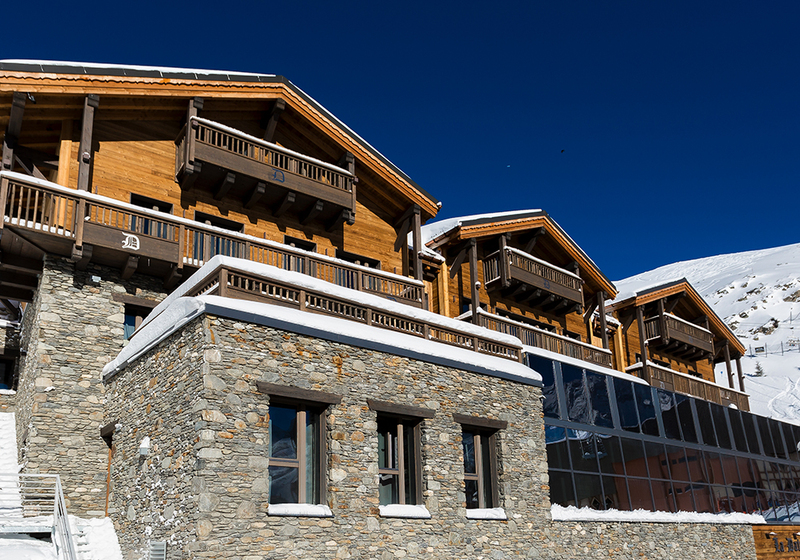 It’s pièce de résistance however is its indoor swimming pool, ideal for post-ski recovery. Slightly off the beaten track in Bellecôte, above the bustle of Courchevel 1850, the Nogentil region is one of great natural beauty. Here you can enjoy the majestic surroundings with total escape, but still only 50m from the ski slopes. Luxury villa rentals in the area don’t come better than Villa Layla – a distinguished property that can sleep large groups of up to 14 guests. Recently undergoing a million-euro renovation, it boasts modern touches while retaining its rustic wood-cabin charm. 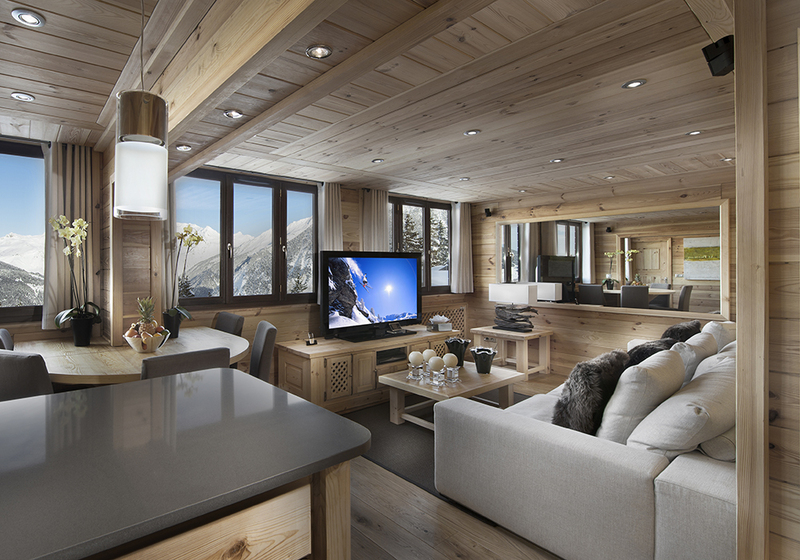 After a hard day on the slopes, sit back and enjoy time out in the private hone theater, game room, indoor swimming pool or spa, or just snuggle up in front of its fireplace and make the most of the stunning surroundings. The enchanting Alpine resort of Val Thorens is one of the highest in Europe. As such, it’s a prime spot for great powder throughout the winter season (November through May), attracting serious winter sports enthusiasts. But it’s equally as accommodating to newbies, with a terrain to suit every level. And since the resort is purpose-built, it has no shortage of all the essentials, including a three Michelin star restaurant, making this a magical place to stay. A luxury home rental is the only way to visit and Villa Talia is one of best properties for larger groups. 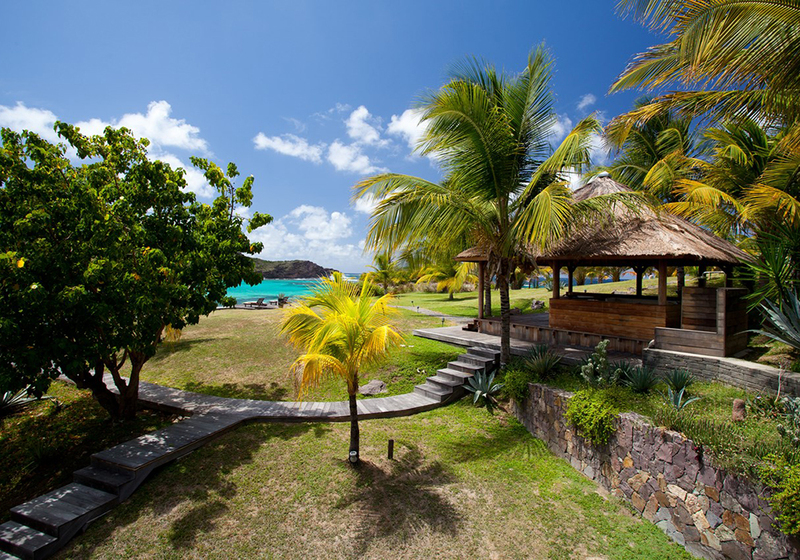 Its five suites accommodate up to 15 guests, treated to charming views across the resort. There’s a bespoke activity room for kids with plenty of entertainment, along with two cinemas, a whirlpool tub, sauna and gym for bigger kids! Plus, there’s a private chef, beautician and masseur on hand to cater to your every whim. In our latest interview series, we’re delighted to provide a rare glimpse into the world of Christian Jagodzinski, founder of Villazzo and widely celebrated tech entrepreneur. An innovator ahead of his time, Jagodzinski made a name for himself in his early twenties launching ‘Telebook’ – Germany’s first fully automated online retailer. The business was snapped up by Amazon and became Amazon Germany. 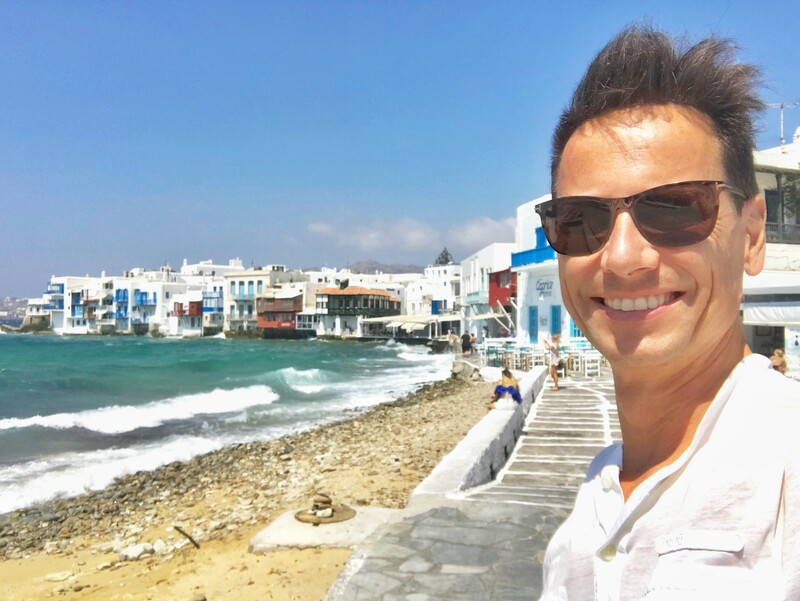 After working as a Director for Amazon for a while, realizing a need to fulfil his entrepreneurial spirit, Christian took an extended sabbatical to travel the world. It was during this time he discovered an untapped niche in the market; premium luxury villas with all the trappings of five-star hotels, for the ultimate vacation. Bringing his passion for luxury travel together with his technical prowess, Villazzo was born. Q: You grew up in Germany and now live in Miami where Villazzo is based. This isn’t your typical Silicon Valley start-up, tell us a bit about how you came to reside in Florida? I’ve always loved Florida, especially Miami Beach. The climate is perfect, it’s a cosmopolitan city with an international vibe and ‘happening’ buzz. It feels like a small resort town with a big city in its backyard! We used to have a small office here already in the late 1990s, long before it became the big international destination it is today. All our workers loved it and still do. Wherever you stay on South Beach, or any of its islands, you’re only ever minutes away from the water, the hottest restaurants, the beach and shops, as well as just 15 minutes from a major international airport hub. Tell me any other place in the world that has the same great set up? Q: Sixteen years’ on since it launched and Villazzo is still going strong. How do you keep up with an ever-changing online and travel landscape? We remain true to our core values that we launched with in 2002. These are to provide a five-star hotel service and management for select top-of-the-line vacation villas. The business was borne out of my personal frustrations renting high end villas. The service lacked any professionalism, it was just people ‘brokering a deal’ forgetting the crucial human touch required to create a memorable vacation. Unfortunately, this hasn’t improved with the abundance of online villa booking sites, driven by price while compromising customer service. I fear that we have come to see the same cut-throat price competition in the villa market as we have in the airline industry, where customers are willing to give up luggage rather than pay $25 extra – it’s a short-sighted approach. You only have to look at the excellent service First-Class customers are given, to understand their loyalty to an airline. Despite fierce competition, premium flyers remain loyal to the provider they receive the best service from. That’s really our approach at Villazzo too. We deliver a First-Class experience to our customers (when booking online or with other agents), and the price difference is well worth it. Q: Tell me a bit about your day-to-day involvement in Villazzo and what your ‘job’ involves? At the start, I was very hands-on managing all the day-to-day operations, greeting clients and hand-picking the villas myself. I realized that in order to focus my efforts and expand the business, I needed to grow them team. Last year I was delighted to appoint Hanna Talaie as General Manager, who oversees everything now. I still care passionately about the business and work hard to uphold our high standards, so remain involved at a strategic level in my new role as Chairman. Q: And what is the most challenging part of your job? First of all, the technical side (website, app, client service systems) has become increasingly important in recent years. While I have a tech background, it remains a challenge to find good developers that can continue to pioneer. We invest a lot in new properties, this includes educating home owners on ‘the Villazzo approach’ to client and property management. It’s a skill we’ve honed over the past 16 years, which ultimately leads to a better experience for home owners and guests alike. Q: Villazzo lists Beyonce and Jay-Z, Madonna and Cristiano Ronaldo among its clients, is it just for the super wealthy? Villazzo-serviced villas do attract an elite customer, with the $5,000+ a night price tag they come with. Acknowledging this, we recently launched our sister company Global Luxury Villas where prices are much lower, and you have a ‘concierge’ service’ instead of a ‘VillaHotel’ service. This is sufficient for a range of clients, and still much better value than a pure online booking site. 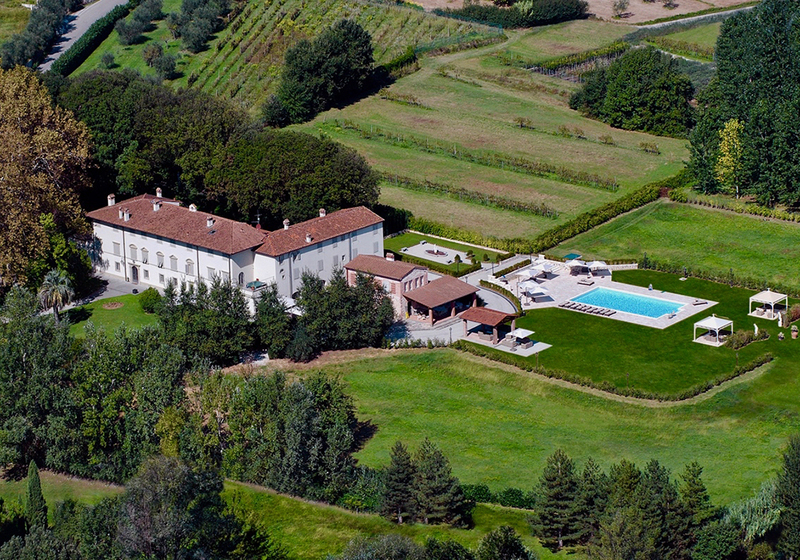 Q: What makes Villazzo stand-out from a five-star hotel, or another luxury villa rental company? We are completely unique. There is no other villa company in the world that offers the level of care and detail that we do. From our carefully curated list of villas and ‘VillaHotel Transformation’ process, to our dedicated service training. We have a reputation for offering the best properties with unrivalled customer service. While there are many outstanding hotels in the world, none of them can offer the sanctuary, space and privacy or our large estates at Villazzo. Q: What’s the most unusual request you’ve had to fulfill from a client!? This is one of the great parts of the job, where you can really make a difference to someone’s stay. We’ve emptied and refilled a 140ft pool (it took six days!) to ensure it was untouched. We furnished a complete villa with brand new mattresses costing $4,000 each, and once we even bought a Rolls Royce Phantom at short notice for a client, which we later shipped to his home in Europe! The most decadent request though, goes to one delightful guest who invited us to redecorate their villa for a quarter of a million dollars – the same value as the villa itself. That was a fun weekend for sure! Q: If you had to pick a destination in the world for unrivalled luxury, where would you choose? One of the perks of the job is that Villazzo is made up of all my favorite destinations; Miami Beach, St. Tropez and Aspen. It’s hard to choose a personal favorite, but Courchevel in France is my go-to destination for skiing, while Mykonos is quickly becoming one of our worst kept secrets! It’s really blowing up in popularity, making now a great time to visit. If you can be flexible with timings, you can expect less than half price rates travelling off-peak. The downside though, is that you might miss out on all the action and buzz that make these destinations so great. Holidays are so important, and so brief, that they should be spent well. I can only advise renting luxury villas with Villazzo’s ‘VillaHotel’ service whenever possible, to guarantee an unforgettable vacation. It’s the main reason why I started Villazzo. Q: And finally, what’s next for Villazzo? As mentioned, we recently launched our sister brand ‘Global Luxury Villas’ by Villazzo, to offer concierge-serviced villa rentals around the world. While they don’t come with the full hotel setup and staffing as VillaHotels do, they are more affordable and in a greater variety of destinations too. We have also opened a Villazzo Investment Fund, to acquire properties with great potential that can make money through VillaHotel rentals in the meantime. While winter may be the season to wrap up warm for many of us, the lucky people of Miami get to bask in the glorious Florida sunshine and revel in the many events taking place. It’s one of the reasons why the ‘Sunshine State’ is so popular for luxury villa rentals this time of year. If you’re wondering where to take a vacation this winter, look no further than Miami – a city that has great food, a thriving art scene, plenty of events and golden beaches for days! 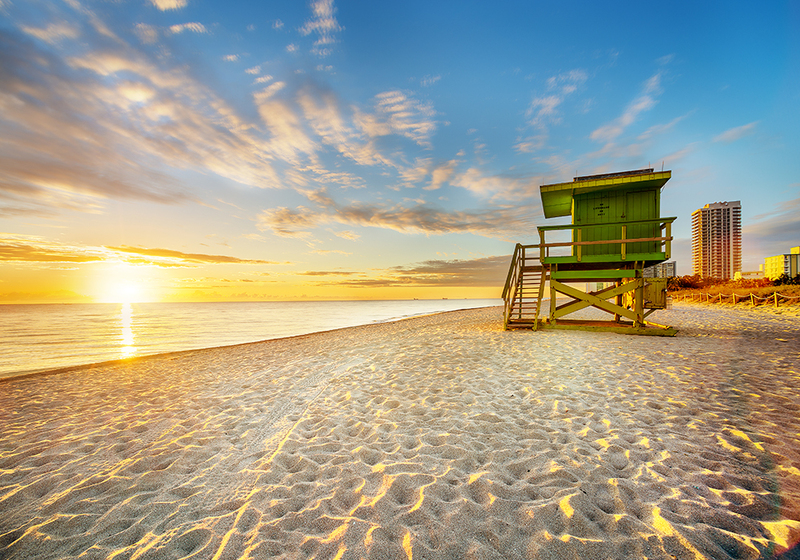 The tropical climate of Miami makes it a year-round favorite with holidaymakers. Yet, winter is one of the most popular seasons to come, with typical temperatures around 24°/75 and rising. At a time when many parts of the world are wrapping up, Miami bucks the trend with its glorious sunshine. 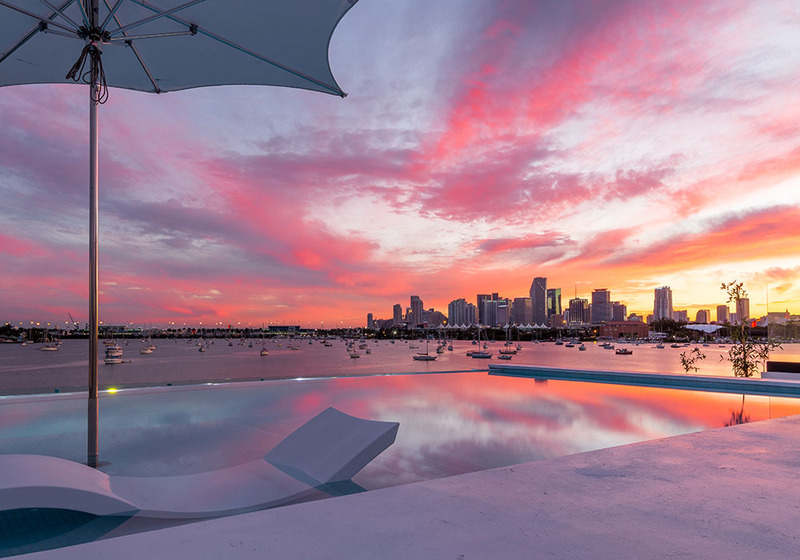 Miami is known for its thriving nightlife and with its privileged island position, sets the perfect scene for cocktails at sunset. 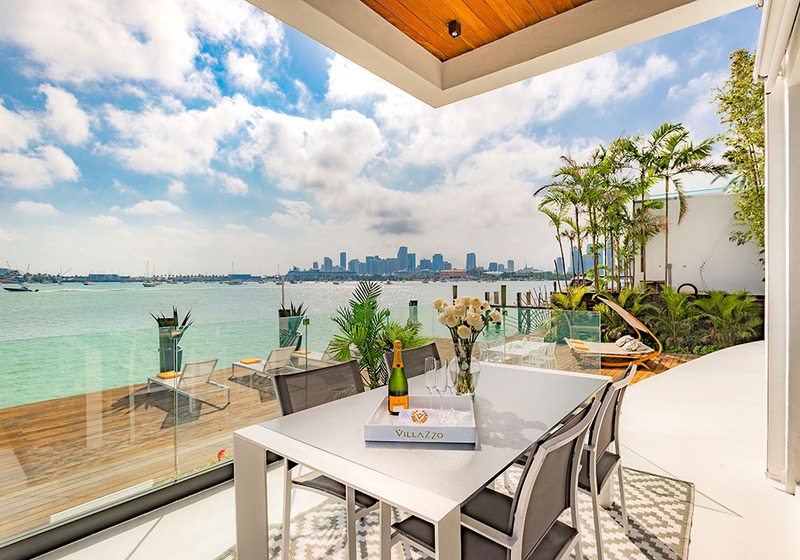 Whether you prefer to enjoy this from your own luxury vacation home, such as Villa Valentina surrounded by water on Jungle Island, or one of the many rooftop bars the city has to offer, you’re spoilt for choice! With thanksgiving, Christmas and New Year’s taking place in Winter, Miami is the perfect gathering for groups. All that’s required is a luxurious place to stay, such as Villa Siri, which includes six bedrooms and its own heated pool (game room, indoor bar, piano and steam room!). With so much on offer, you’ll never have to leave the island to celebrate with good company. Known for its golden stretches of sand and turquoise waters, Miami’s beach scene is one of its timeless tourist attractions. With so much space, there’s always plenty of room for visitors, some who come for the surf. 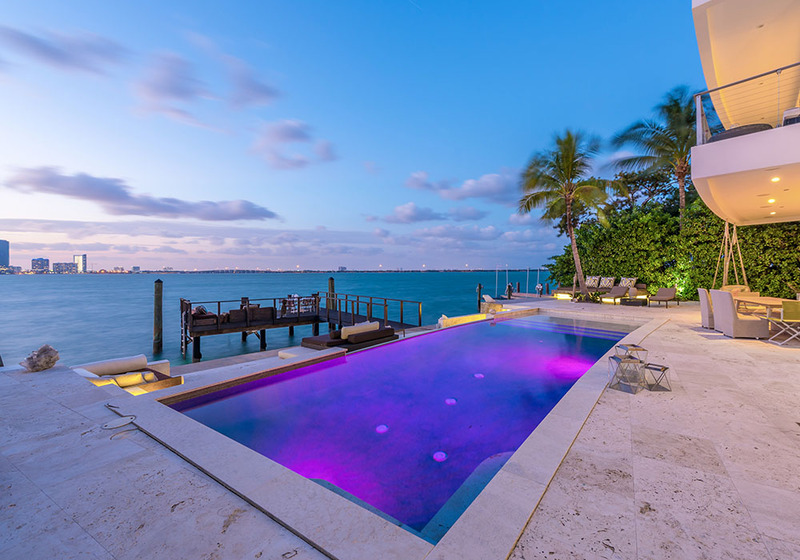 Of course, Miami is a city that revels in glamour and decadence, so for the true Miami experience, book a luxury home. 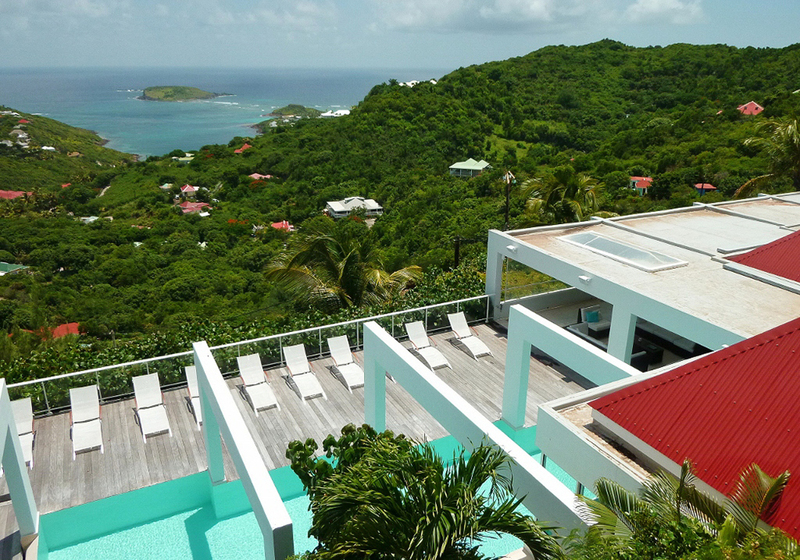 Villa Vanya offers tranquil views of the bay from your very own pool. That’s how Miami rolls! During the winter months, Miami perks up with some of the most renowned international festivals coming to the city. Miami’s famed art deco scene comes alive during Art Basel (6-9 December) with 70,000 visitors descending on the city. This is a fun time to experience the city’s vibrant art scene, with paintings, sculptures, installations, photos and film, showcased throughout 250 galleries. Meanwhile, attracting a jet-set crowd, the International Boat Show, livens up the city with the annual event returning 14-18 February. The only way to visit is by boat, which can be moored up at your own private dock at Villa Melissa. 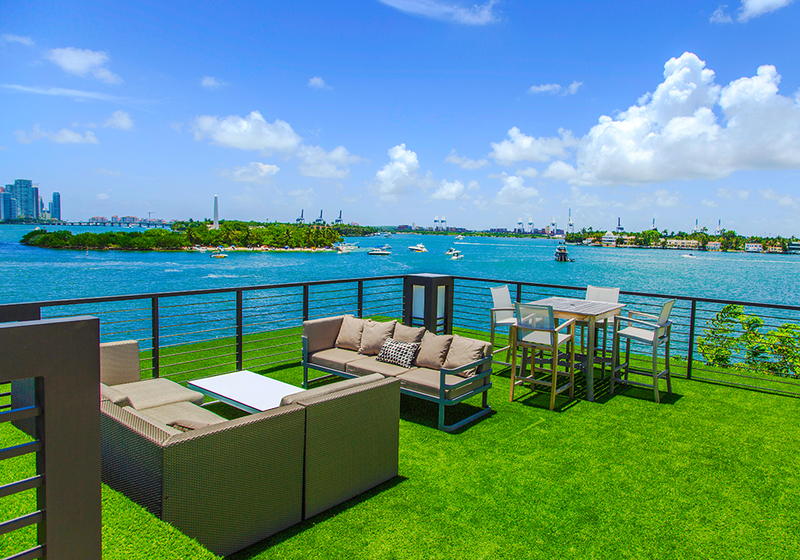 Set in the prime location of Jungle Island, this luxury vacation home is within easy reach of the Marina Stadium for guests attending the show. 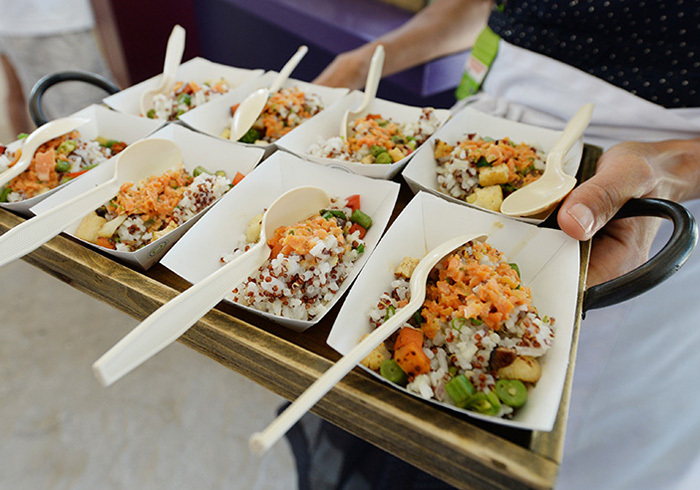 If you’re a foodie, then stick around and join the 60,000 guests that come here for the South Beach Wine & Food Festival from 20th February. 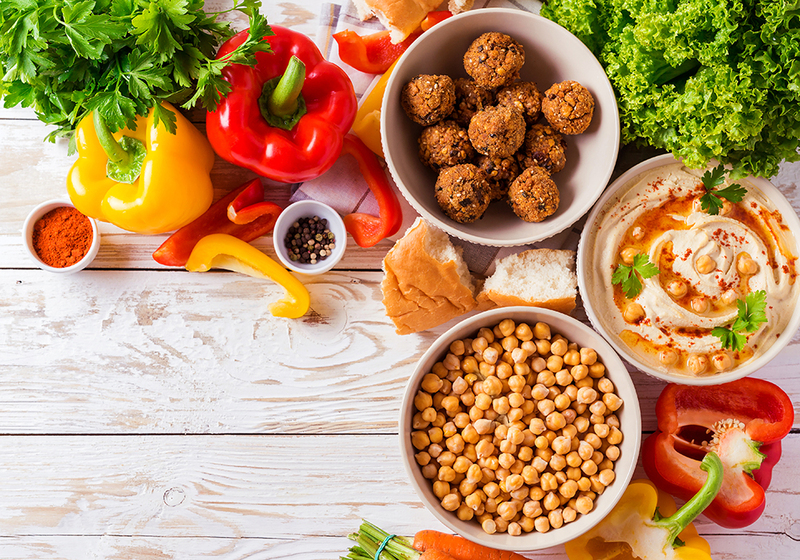 With 85 events throughout the five-day festival, it’s an unmissable opportunity to enjoy renowned chefs serving up creative fusions at the forefront of international cuisine. And finally, winter in Miami means only one thing for fans of electric dance music, and that’s the Winter Music Conference. Attracting global superstars and international DJs, Miami is put on a world stage when it returns on 25-21 March. Get those glow sticks out! After months of preparing for the big day, there’s still one gift that newlyweds get to enjoy once the celebrations are over… and that’s a luxury vacation home as part of the honeymoon. In Europe alone, there’s endless options for every type of honeymooner. From the chic shores of the French Riviera, to the tranquil pace of Greece, and breath-taking views of Italy. Culture and cuisine, sun and swim – whatever your heart’s desire, you can find it here. Greece is a timeless destination, second to none for romance, picture-postcard beaches and its famed warm hospitality. It’s what makes it so appealing to visitors, especially newlyweds. Surrounded by the warm Ionian Sea, the dreamy island of Zakynthos was made for lovers! Here you can soak up the sunshine by day, and enjoy great food and entertainment by night. 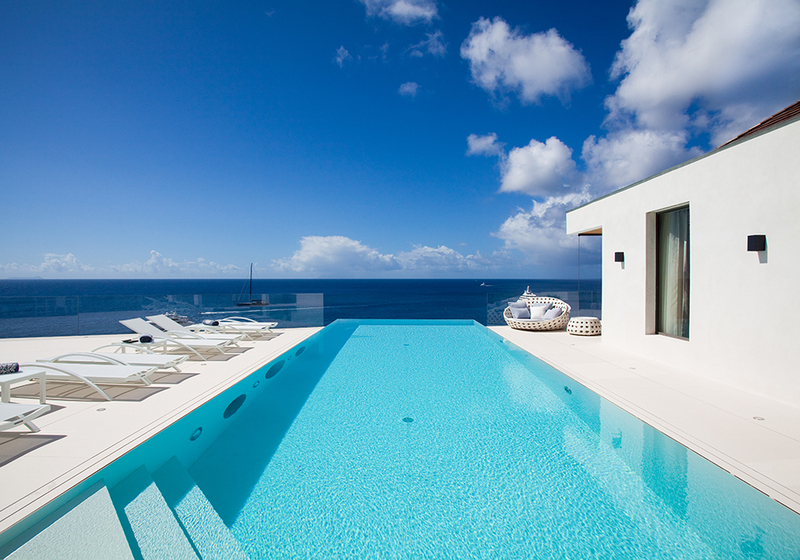 For an unrivalled stay, Villa Marina is one of the best luxury villas to rent on the island. 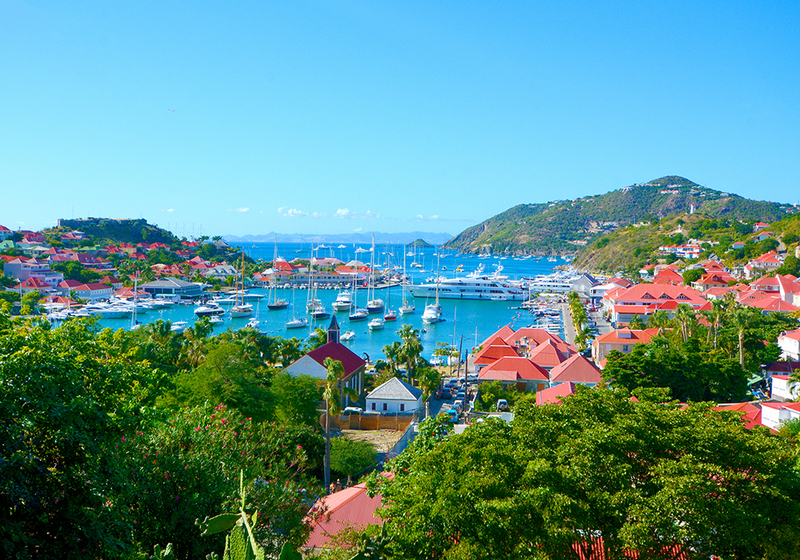 Its tranquil vibe and delightful views over the harbor are conducive to recharging. While its heated pool complete with hydro massage is everything you need to relax in paradise. Join the jet set list of celebrities that have honeymooned in the Amalfi Coast, including; chef Jamie Oliver, actress Reese Witherspoon and tech entrepreneur Mark Zuckerberg. For a romantic retreat, try Villa Divina; its clifftop position boasts sweeping views over the coast, while indoors its regal touches make you feel like a member of royalty! 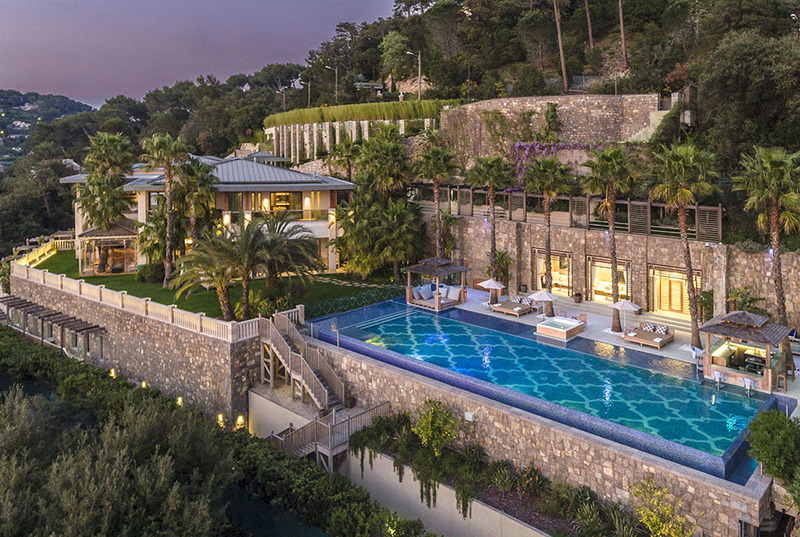 With a romantic fireplace and cliff-edge pool, you’ll see why they call it la dolce vita. It’s hard not to fall in love with Ibiza. This magical island is not just for party people – it also draws those hoping to reconnect, unwind or enjoy good company. It couldn’t be more fitting for those on honeymoon. 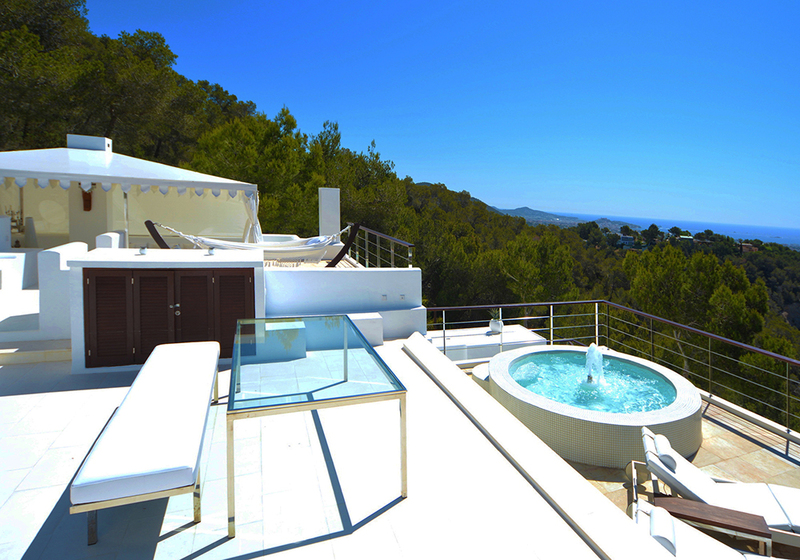 Staying at https://global-luxury-villas.com/ibiza-rental-villas/villa-ivana offers the perfect vacation rental for a chilled get-away. This luxurious cliff top property boasts three grand bedrooms, decorated to the highest standard. Its modern design and inviting swimming pool provide the perfect backdrop for married life to begin. Always a contender for romance and respite, the French Riviera will add a chic touch to your honeymoon. 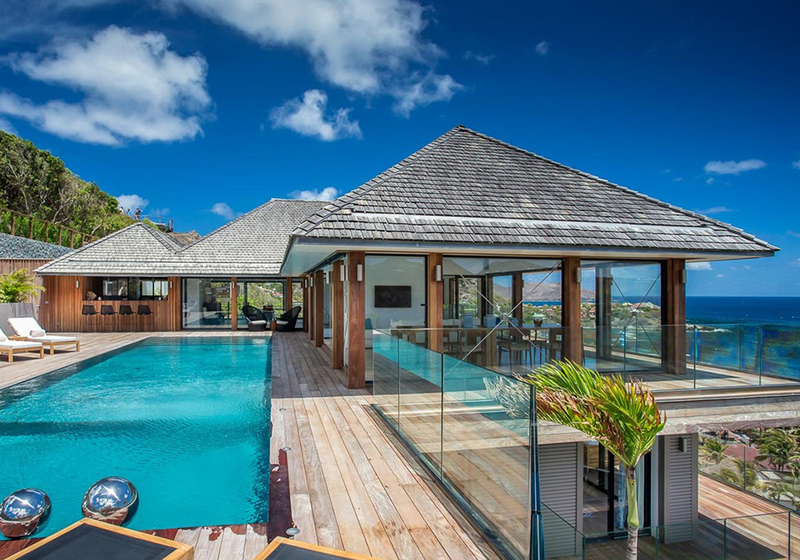 If you’re looking for grandeur, decadence and next-level luxury, then Villa Leslie is ‘the one’! 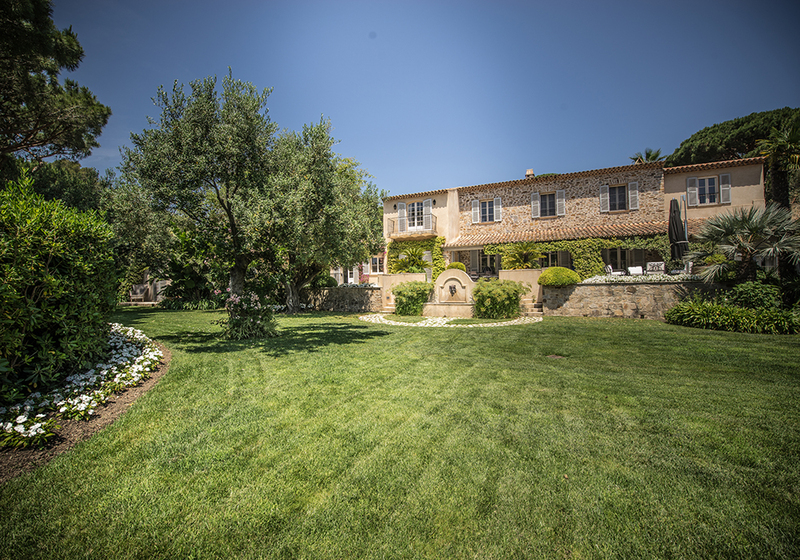 High in the hills, this magnificent property is within easy reach of Cannes, yet distant enough to enjoy seclusion. That said, you may never want to leave, since this property that has it covered; a heated swimming pool with swim up bar, breath-taking views from every inch of its massive terrace, a private cinema, massage centre, hair and nail station and full-size boxing ring! Ensuring that you’ll never have to lift a finger, ring once for your butler and twice for private chef… well, you are on honeymoon after all! 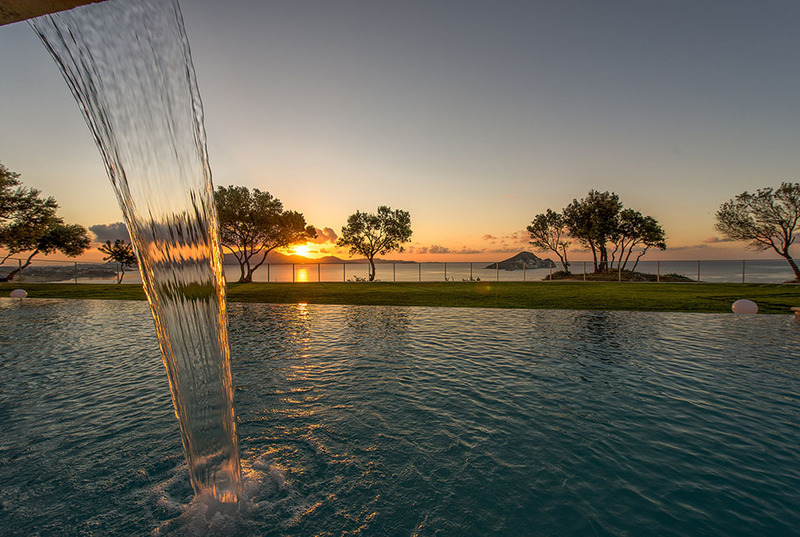 For a memorable stay, Global Luxury Villas offers some of the most exclusive luxury vacation homes in the world. With outstanding customer service and an unrivaled portfolio of properties, you’re guaranteed a five-star stay. Dripping in culture and attracting foodies from the world over, there are some 3.2 million hectares of vineyard to conqueror throughout Europe. 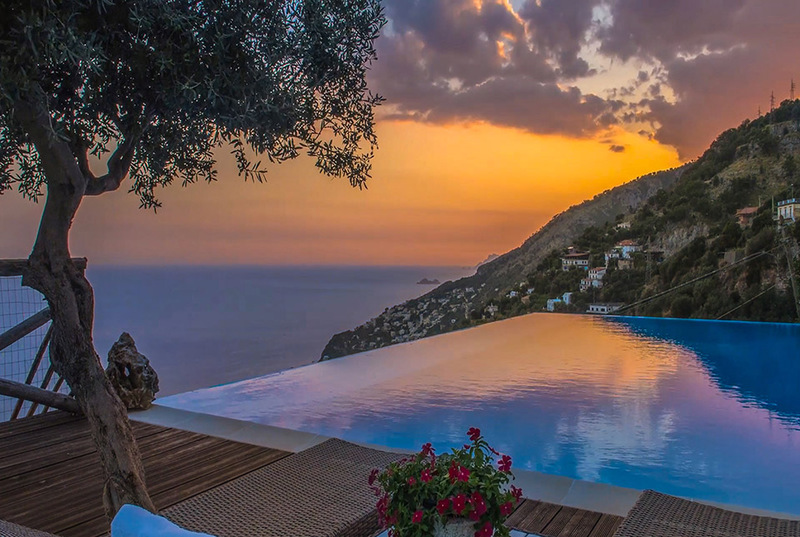 But knowing where to find your dream luxury villa rental can be the hardest part. With so many visitors wanting to soak up the local culture, as well as enjoy a tipple or two, we’ve compiled some of the best destinations to help you on your way. Known around the world for its high-quality produce, France is a must-visit for wine connoisseurs. One of the most celebrated wine-growing regions is Bordeaux – synonymous with great food and drink – some even say it’s the wine capital of the world. For gastronomy lovers, Villa Tatiana is one of the most exquisite residences in the region to base yourself. It’s within close proximity to no less than eight Michelin star restaurants and endless vineyards, including; Latour, Margaux, Haut Brion and Cheval Blanc. What makes this country estate so special though, is its early 20th-century architecture and vast space with eight rooms. It’s the ideal base for wine-lovers and big groups to come together. Further south, the glamourous shores of Saint-Tropez attract a well-heeled and well cultured set. Not just offering glamourous clubs, designer shops and yacht-upon-yacht, Saint-Tropez is perfectly positioned to enjoy a number of local vineyards in the area. Finding the right vacation home allows you to enjoy the best of both worlds, all of which can be found in Villa Anastasia a seven-bedroom property offering the ultimate luxury get-away. Its sizeable gourmet kitchen is the perfect place to rustle up dishes using local ingredients, best enjoyed al fresco with plenty of outdoor space to choose from. 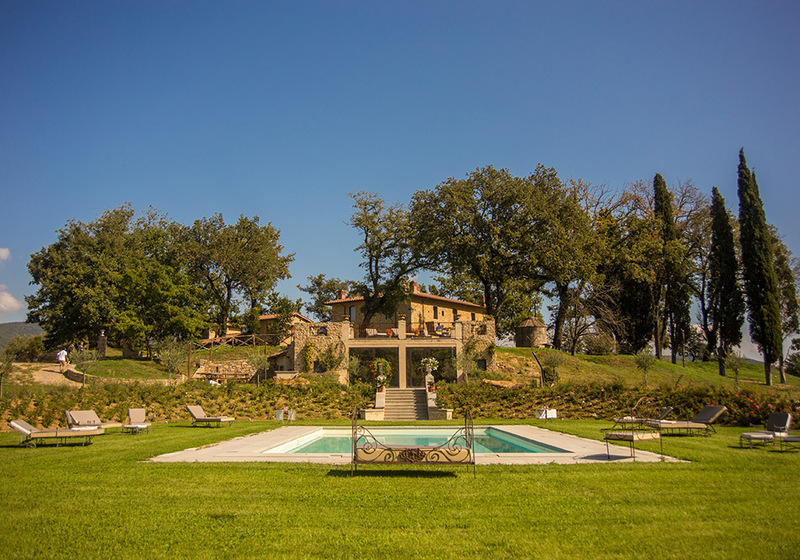 This lavish property is well placed too – 55 minutes from the airport and within driving distance to a number of charming vineyards in the area. These include Domaine Bertaud Belieu and Chateau Minuty, which offer tours and tastings. 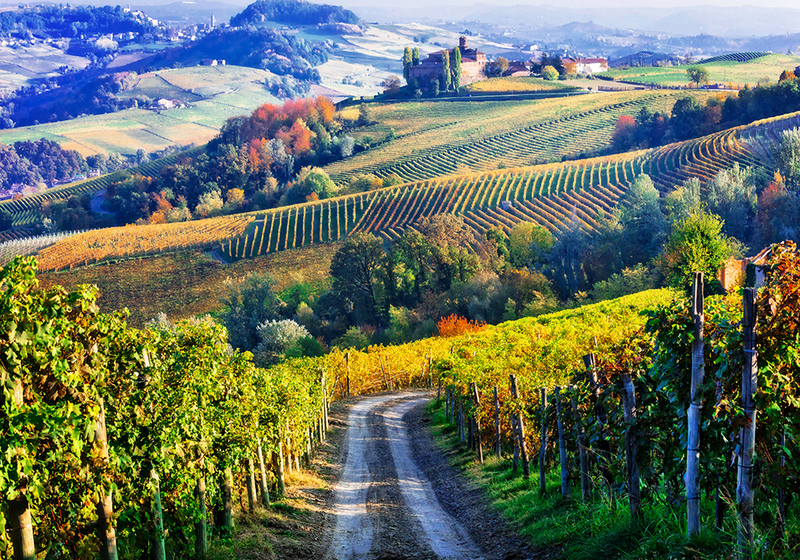 There’s no shortage of vineyards to visit in Italy. But, if you want to combine your stay while soaking up the local culture, the vicinity of Montecatini Terme is a must! Perfectly positioned between Florence, Pisa, Siena and Lucca, it offers the ideal base for exploring the many wineries in this bustling Tuscan region. 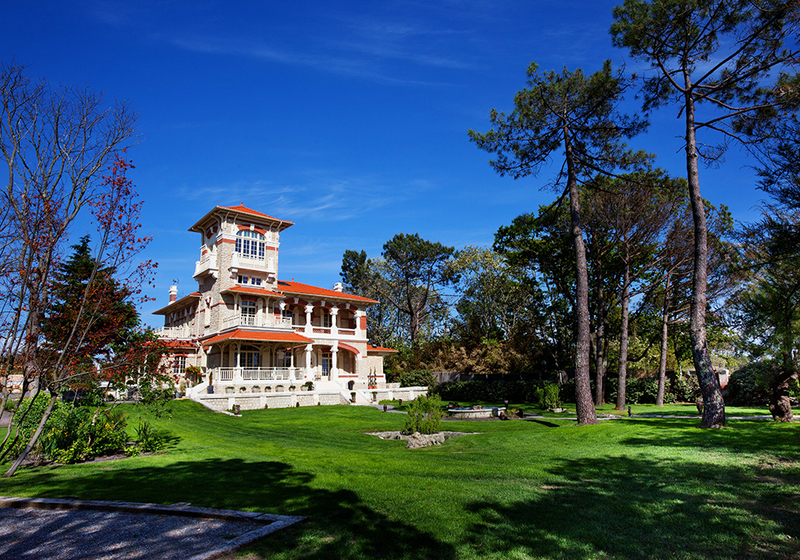 When it’s time to rest your weary head, a fabulous place to stay is Vila Pilar. With 11 bedrooms and a stunning outdoor area with private pool, this sprawling mansion is great for larger groups. It celebrates the very best of rural Italy, with thermal resorts and medieval villages close by. Enjoy gentle walks to the village to enjoy fresh baked goods and local wine – a simple delight that many flock from afar to enjoy.